There are a few types of clothing that will be damaged or ruined if you put them in the dryer. The high temperatures and tumbling motion of clothes dryers prove to be too much for the fibers of some delicate fabrics. To maintain these types of clothing, you can drip dry them indoors, hang them outside to air dry or lay on a flat surface to dry and maintain their shape. Bras and other delicates shouldn't be put in the dryer or they will be damaged. If dried in a clothes dryer, sweaters are susceptible to shrinking, stretching, pilling and unraveling. It's crucial that you read the care label on your sweater to get specific instructions about washing the type of fiber, but all sweaters are best left out of the dryer. Acrylic fibers stretch when heated, angora and cotton shrink, while chenille, wool and silk are prone to unraveling when agitated by the dryer drum. All types of sweaters can lose their shape when washed and dried, so it is advised to lay sweaters out flat on a towel and reshape them to dry. If you absolutely must dry your sweaters in a machine, use a low heat or fluff setting to dry them partially and let them finish air drying on a flat surface. Bras should always be hand washed and air dried. Laundry machines can cause them to twist, unravel the threads or lose their shape. Many bras are made from extremely delicate fabrics that can be torn or unraveled from repeated tumbling in the dryer. Cotton bras, although made from a less delicate fabric, are prone to shrinking in a machine dryer. Bras with underwires may be irreparably damaged because the motion in the dryer can cause the wires to bend out of shape. If you machine dry bras with other clothes, the straps can tangle or wrap around the other clothing articles. Some people have success machine washing bras on a delicate setting. 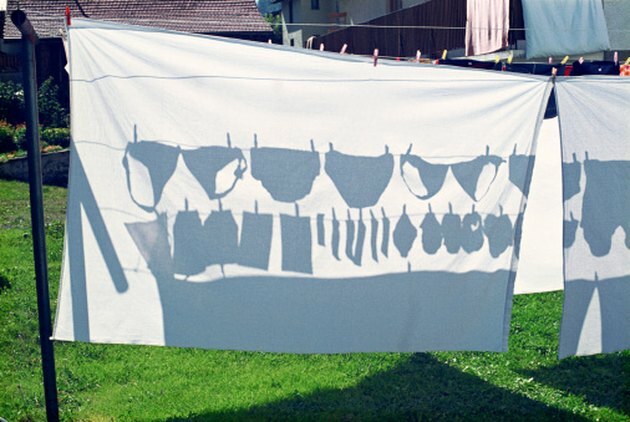 After washing, reshape the bra and then hang it to dry. Silk is a luxurious fabric with a smooth surface that is extremely delicate. It is used to make everything from ties and scarves to shirts and undergarments. Most silk care labels require hand washing or dry cleaning only in order to protect the integrity of the silk. Tumble machine dryers are extremely damaging on silk garments. The high heat inside the dryer can cause the silk to shrink. Tumbling in a dryer causes friction between the dryer drum and the garment which can cause the threads to break or leave white streaks on garment. For best results, hang dry silk garments to maintain the shape. They should be dried out of direct sunlight because sunlight can fade the color and damage the fibers. Depending on the care instructions on the label, you may be able to put it in the dryer on the "fluff" setting. Wool and wool blends should never be put in the dryer. The heat and friction of the dryer can cause the fabric to shrink. Even if you use air fluff wool in the dryer, they can quickly and easily lose their shape because wet wool fabrics are even more prone to lose their shape than dry fabrics. Always handle wet wool with care to prevent stretching and unraveling. They should be laid on a towel and reshaped and then allowed to air dry in the flat position. If you were to hang wool on a clothes line, it would quickly stretch and lose its shape. Read care label instructions carefully before washing or drying wool because some wool garments are strictly dry clean only. Do Acrylic & Polyester Shrink When Put in the Dryer?